Having had car trouble in McConnellsburg on an extremely hot summer day, I was invited to rest and soak up some air conditioning at a business near my disabled car. While sitting in the showroom, I noticed a selection of beautiful barn quilts sitting along the wall. After asking some questions I was told these quilt blocks were for sale. While looking at the quilt blocks my husband arrived to pick me up. I explained to him that these blocks were for sale, and immediately we were both drawn to this beautiful blue and aqua barn quilt called Nova #2. I had been hoping to get a barn quilt for several months but just wasn't sure how to go about it. Voila! Although it was a tough day with my vehicle issues, it turned out to be a good day as here was a quilt block we loved and that was ready to be mounted. 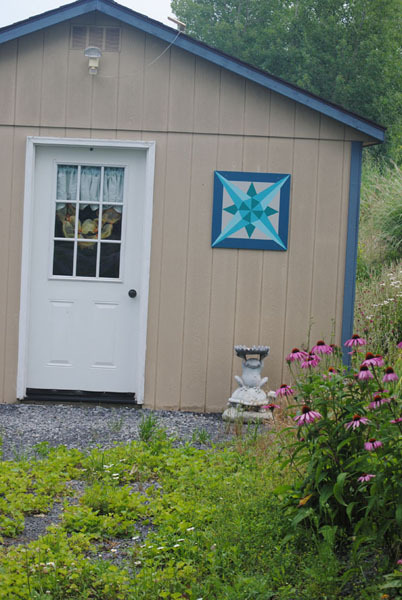 We filled out the paper work, got approval, and are now on the Frontier Barn Quilt Trail of Fulton County, PA.